Forget about Trump collusion with Russia, let’s talk about Vatican II’s collusion with the monks of Collegeville! 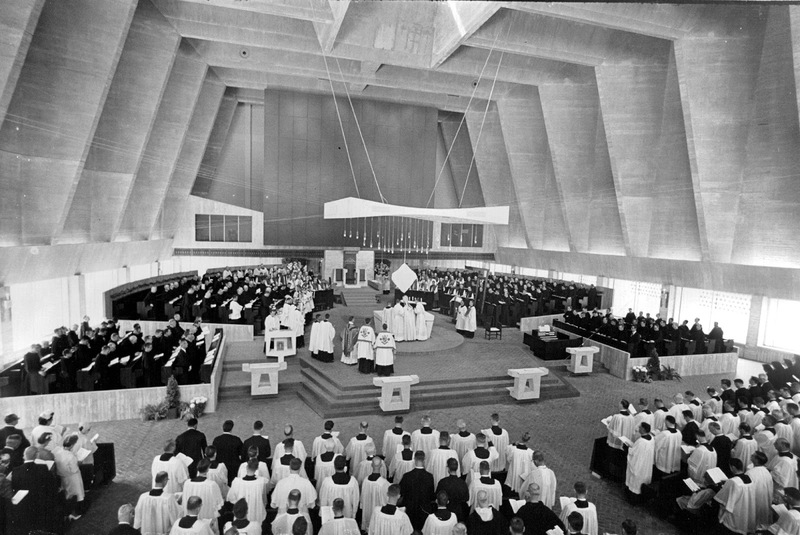 Their abbey church was completed before Vatican II began and its consecration was in 1961 before Vatican II and Sacrosanctum Concillium and certainly before the USCCB’s horrid documents on Architecture and Environment. Something is fishy in Denmark, Collegeville and Rome. The current and ongoing crisis in the Church and in all its devastating forms, especially liturgical, can these be traced to Collegeville and not Bugnini? Let the conspiracy theories begin! Well the days depicted in that photo of Collegeville are long gone. With Vatican Disaster II's "magic" they may never fill that church with monks again. In the Midwest of the US at least, it was Collegeville, Collegeville, Collegeville, when the local clergy wanted to justify the deforms they thrust on us. I cannot say that Collegeville was directly in collusion with Rome, but they were with others around the world like them. That is to say, you can see that already the Modernists in the form of the Liturgical Movement had well infiltrated the Church because they had slowly become tolerated, but still needed Vatican II to let loose their erroneous and very damaging doctrines. I believe that in another 50-100 years, because there are still too many of them in power now, some of the teaching of the LM will be declared heretical, particularly with the idea that active participation by the people is more important than giving God proper worship. I'm not sure that the Collgeville church is that innovative, it just looks like a Roman basilica done in the style of brutalist architecture. Though a Roman basilica would have a large apse mosaic to overshadow the abbot's throne. The original church looks like a church. It doesn’t matter if it is being used as a church. Even if it is used as a restaurant, it still looks like a church. That is it’s beauty, it’s appeal. It comes from its shape and it’s details. Unique and recognizable by design . The new church is non descriptive, by design. Used as a church, it doesn’t look like a church It is androgynous. The conspiracy is that it was built for one purpose so that it could easily be converted to another. It’s an “ugly church “ but is it an ugly assembly hall, or an ugly concert hall, or an ugly conference hall, or ugly restaurant? Liverpool Metropolitan Cathedral (aka the Mersey Funnel or Paddy's Wigwam), a circular building with a central altar, was designed by Frederick Gibberd in 1958 and built between 1962 and 1967. Basil Spence's rebuilt Coventry Cathedral predates it by only five years but its layout, though modern, is more 'traditional', although its orientation is south to north. Of the two, I prefer Liverpool (at least during the day when its stained glass is seen to best effect) and the advantage of these 'churches in the round' is that the priest has to have his back to someone!